The shape of the Earth is represented as a sphere. It is also modeled more accurately as an oblate spheroid or an ellipsoid. A globe is a scaled down model of the Earth. Although they can represent size, shape, distance and directions of the Earth features with reasonable accuracy, globes are not practical or suitable for many applications. They are hard to transport and store; for example you can not stuff a globe in your backpack while hiking or store it in your car’s glove compartment. Globes are not suitable for use at large scales, such as finding directions in a city or following a hiking route, where a more detailed image is essential. They are expensive to produce, especially in varying sizes (scales). On a curved surface, measuring terrain properties is difficult, and it is not possible to see large portions of the Earth at once. Maps do not suffer from the above shortcomings and are more practical than globes in most applications. Historically cartographers have tried to address the challenge of representing the curved surface of the Earth on a map plane, and to this end have devised map projections. A map projection is the transformation of Earth’s curved surface (or a portion of) onto a two-dimensional flat surface by means of mathematical equations. During such transformation, the angular geographic coordinates (latitude, longitude) referencing positions on the surface of the Earth are converted to Cartesian coordinates (x, y) representing position of points on a flat map. One way of classifying map projections is by the type of the developable surface onto which the reference sphere is projected. A developable surface is a geometric shape that can be laid out into a flat surface without stretching or tearing. The three types of developable surfaces are cylinder, cone and plane, and their corresponding projections are called cylindrical, conical and planar. Projections can be further categorized based on their point(s) of contact (tangent or secant) with the reference surface of the Earth and their orientation (aspect). Keep in mind that while some projections use a geometric process, in reality most projections use mathematical equations to transform the coordinates from a globe to a flat surface. The resulting map plane in most instances can be rolled around the globe in the form of cylinder, cone or placed to the side of the globe in the case of the plane. The developable surface serves as a good illustrative analogy of the process of flattening out a spherical object onto a plane. In cylindrical projections, the reference spherical surface is projected onto a cylinder wrapped around the globe. The cylinder is then cut lengthwise and unwrapped to form a flat map. The cylinder may be either tangent or secant to the reference surface of the Earth. In the tangent case, the cylinder’s circumference touches the reference globe’s surface along a great circle (any circle having the same diameter as the sphere and thus dividing it into two equal halves). The diameter of the cylinder is equal to the diameter of the globe. The tangent line is the equator for the equatorial or normal aspect; while in the transverse aspect, the cylinder is tangent along a chosen meridian (i.e. central meridian). In the secant case, the cylinder intersects the globe; that is the diameter of the cylinder is smaller than the globe’s. At the place where the cylinder cuts through the globe two secant lines are formed. The tangent and secant lines are important since scale is constant along these lines (equals that of the globe), and therefore there is no distortion (scale factor = 1). Such lines of true scale are called standard lines. These are lines of equidistance. Distortion increases by moving away from standard lines. 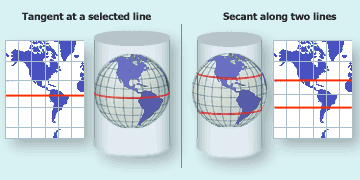 In normal aspect of cylindrical projection, the secant or standard lines are along two parallels of latitude equally spaced from equator, and are called standard parallels. In transverse aspect, the two standard lines run north-south parallel to meridians. Secant case provides a more even distribution of distortion throughout the map. Features appear smaller between secant lines (scale < 1) and appear larger outside these lines (scale > 1). 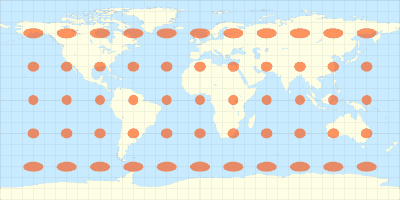 The aspect of the map projection refers to the orientation of the developable surface relative to the reference globe. The graticule layout is affected by the choice of the aspect. In normal or equatorial aspect, the cylinder is oriented (lengthwise) parallel to the Earth’s polar axis with its center located along the equator (tangent or secant). The meridians are vertical and equally spaced; the parallels of latitude are horizontal straight lines parallel to the equator with their spacing increasing toward the poles. Therefore the distortion increases towards the poles. Meridians and parallels are perpendicular to each other. The meridian that lies along the projection center is called the central meridian. In transverse aspect, the cylinder is oriented perpendicular to the Earth’s axis with its center located on a chosen meridian (a line going through the poles). And the oblique aspect refers to the cylinder being centered along a great circle between the equator and the meridians with its orientation at an angle greater than 0 and less than 90 degrees relative to the Earth’s axis. 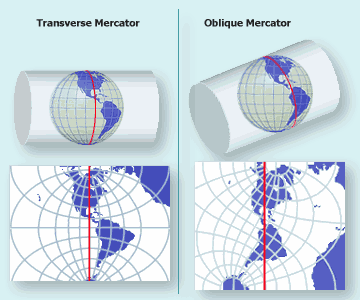 Examples of cylindrical projections include Mercator, Transverse Mercator, Oblique Mercator, Plate Carré, Miller Cylindrical, Cylindrical equal-area, Gall–Peters, Hobo–Dyer, Behrmann, and Lambert Cylindrical Equal-Area projections. In conical or conic projections, the reference spherical surface is projected onto a cone placed over the globe. The cone is cut lengthwise and unwrapped to form a flat map. The cone may be either tangent to the reference surface along a small circle (any circle on the globe with a diameter less than the sphere’s diameter) or it may cut through the globe and be secant (intersect) at two small circles. For the polar or normal aspect, the cone is tangent along a parallel of latitude or is secant at two parallels. These parallels are called standard parallels. This aspect produces a map with meridians radiating out as straight lines from the cone’s apex, and parallels drawn as concentric arcs perpendicular to meridians. Scale is true (scale factor = 1) and there is no distortion along standard parallels. Distortion increases by moving away from standard parallels. Features appear smaller between secant parallels and appear larger outside these parallels. Secant projections lead to less overall map distortion. The polar aspect is the normal aspect of the conic projection. In this aspect the cone’s apex is situated along the polar axis of the Earth, and the cone is tangent along a single parallel of latitude or secant at two parallels. The cone can be situated over the North or South Pole. The polar conic projections are most suitable for maps of mid-latitude (temperate zones) regions with an east-west orientation such as the United States. In transverse aspect of conical projections, the axis of the cone is along a line through the equatorial plane (perpendicular to Earth’s polar axis). Oblique aspect has an orientation between transverse and polar aspects. Transverse and oblique aspects are seldom used. Examples of conic projections include Lambert Conformal Conic, Albers Equal Area Conic, and Equidistant Conic projections. In planar (also known as azimuthal or zenithal) projections, the reference spherical surface is projected onto a plane. 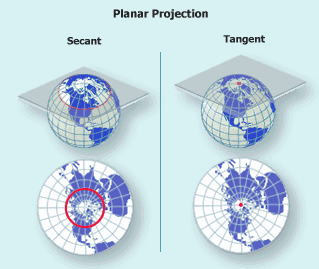 The plane in planar projections may be tangent to the globe at a single point or may be secant. In the secant case the plane intersects the globe along a small circle forming a standard parallel which has true scale. The normal polar aspect yields parallels as concentric circles, and meridians projecting as straight lines from the center of the map. The distortion is minimal around the point of tangency in the tangent case, and close to the standard parallel in the secant case. The polar aspect is the normal aspect of the planar projection. The plane is tangent to North or South Pole at a single point or is secant along a parallel of latitude (standard parallel). 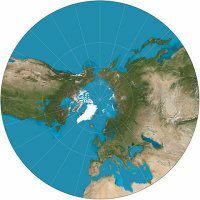 The polar aspect yields parallels of latitude as concentric circles around the center of the map, and meridians projecting as straight lines from this center. Azimuthal projections are used often for mapping Polar Regions, the polar aspect of these projections are also referred to as polar azimuthal projections. In transverse aspect of planar projections, the plane is oriented perpendicular to the equatorial plane. And for the oblique aspect, the plane surface has an orientation between polar and transverse aspects. These projections are named azimuthal due to the fact that they preserve direction property from the center point of the projection. Great circles passing through the center point are drawn as straight lines. Examples of azimuthal projections include: Azimuthal Equidistant, Lambert Azimuthal Equal-Area, Gnomonic, Stereographic, and Orthographic projections. Some classic azimuthal projections are perspective projections and can be produced geometrically. They can be visualized as projection of points on the sphere to the plane by shining rays of light from a light source (or point of perspective). Three projections, namely gnomonic, stereographic and orthographic can be defined based on the location of the perspective point or the light source. The point of perspective or the light source is located at the center of the globe in gnomonic projections. Great circles are the shortest distance between two points on the surface of the sphere (known as great circle route). Gnomonic projections map all great circles as straight lines, and such property makes these projections suitable for use in navigation charts. Distance and shape distortion increase sharply by moving away from the center of the projection. In stereographic projections, the perspective point is located on the surface of globe directly opposite from the point of tangency of the plane. Points close to center point show great distortion on the map. Stereographic projection is a conformal projection, that is over small areas angles and therefore shapes are preserved. It is often used for mapping Polar Regions (with the source located at the opposite pole). In orthographic projections, the point of perspective is at infinite distance on the opposite direction from the point of tangency. The light rays travel as parallel lines. The resulting map from this projection looks like a globe (similar to seeing Earth from deep space). There is great distortion towards the borders of the map. As stated above spherical bodies such as globes can represent size, shape, distance and directions of the Earth features with reasonable accuracy. It is impossible to flatten any spherical surface (e.g. an orange peel) onto a flat surface without some stretching, tearing, or shearing. Similarly, when trying to project a spherical surface of the Earth onto a map plane, the curved surface will get deformed, causing distortions in shape (angle), area, direction or distance of features. All projections cause distortions in varying degrees; there is no one perfect projection preserving all of the above properties, rather each projection is a compromise best suited for a particular purpose. Different projections are developed for different purposes. Some projections minimize distortion or preserve some properties at the expense of increasing distortion of others. The choice of a projection for a map depends on such factors as the purpose for which the map will be used, the area being mapped, and the map’s scale (distortion is more pronounced in small-scale mapping). As mentioned above, a reference globe (reference surface of the Earth) is a scaled down model of the Earth. This scale can be measured as the ratio of distance on the globe to the corresponding distance on the Earth. Throughout the globe this scale is constant. For example, a 1:250000 representative fraction scale indicates that 1 unit (e.g. km) on the globe represents 250000 units on Earth. The principal scale or nominal scale of a flat map (the stated map scale) refers to this scale of its generating globe. However the projection of the curved surface on the plane and the resulting distortions from the deformation of the surface will result in variation of scale throughout a flat map. In other words the actual map scale is different for different locations on the map plane and it is impossible to have a constant scale throughout the map. This variation of scale can be visualized by Tissot's indicatrix explained in detail below. Measure of scale distortion on map plane can also be quantified by the use of scale factor. Scale factor is the ratio of actual scale at a location on map to the principal (nominal) map scale (SF = actual scale / nominal scale). This can be alternatively stated as ratio of distance on the map to the corresponding distance on the reference globe. A scale factor of 1 indicates actual scale is equal to nominal scale, or no scale distortion at that point on the map. Scale factors of less than or greater than one are indicative of scale distortion. The actual scale at a point on map can be obtained by multiplying the nominal map scale by the scale factor. As an example, the actual scale at a given point on map with scale factor of 0.99860 at the point and nominal map scale of 1:50000 is equal to (1:50000 x 0.99860) = (0.99860 / 50000) = 1:50070 (which is a smaller scale than the nominal map scale). Scale factor of 2 indicates that the actual map scale is twice the nominal scale; if the nominal scale is 1:4million, then the map scale at the point would be (1:4million x 2) = 1:2million. A scale factor of 0.99950 at a given location on the map indicates that 999.5 meters on the map represents 1000 meters on the reference globe. As mentioned above, there is no distortion along standard lines as evident in following figures. On a tangent surface to the reference globe, there is no scale distortion at the point (or along the line) of tangency and therefore scale factor is 1. Distortion increases with distance from the point (or line) of tangency. On a secant surface to the reference globe, there is no distortion along the standard lines (lines of intersection) where SF = 1. Between the secant lines where the surface is inside the globe, features appear smaller than in reality and scale factor is less than 1. At places on map where the surface is outside the globe, features appear larger than in reality and scale factor is greater than 1. A map derived from a secant projection surface has less overall distortion than a map from a tangent surface. A common method of classification of map projections is according to distortion characteristics - identifying properties that are preserved or distorted by a projection. The distortion pattern of a projection can be visualized by distortion ellipses, which are known as Tissot's indicatrices. Each indicatrix (ellipse) represents the distortion at the point it is centered on. The two axes of the ellipse indicate the directions along which the scale is maximal and minimal at that point on the map. 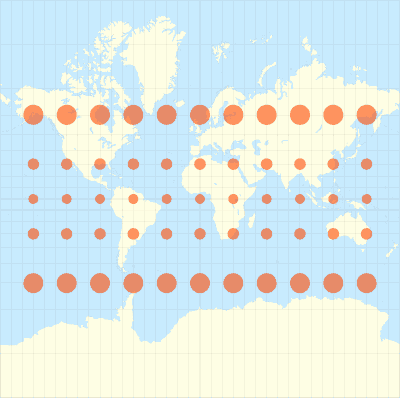 Since scale distortion varies across the map, distortion ellipses are drawn on the projected map in an array of regular intervals to show the spatial distortion pattern across the map. The ellipses are usually centered at the intersection of meridians and parallels. Their shape represents the distortion of an imaginary circle on the spherical surface after being projected on the map plane. The size, shape and orientation of the ellipses are changed as the result of projection. Circular shapes of the same size indicate preservation of properties with no distortion occurring. Equal area map projections (also known as equivalent or authalic projection) represent areas correctly on the map. The areas of features on the map are proportional to their areas on the reference surface of Earth. Maintaining relative areas of features causes distortion in their shapes, which is more pronounced in small-scale maps. 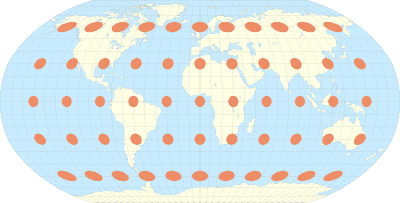 The shapes of the Tissot’s ellipses in this world map Gall-Peters cylindrical equal-area projection are distorted; however each of them occupies the same amount of area. Along the standard parallel lines in this map (45° N and 45°S), there is no scale distortion and therefore the ellipses would be circular. Equal area projections are useful where relative size and area accuracy of map features is important (such as displaying countries / continents in world maps), as well as for showing spatial distributions and general thematic mapping such as population, soil and geological maps. Some examples are Albers Equal-Area Conic, Cylindrical Equal Area, Sinusoidal Equal Area, and Lambert Azimuthal Equal Area projections. In conformal map projections (also known as orthomorphic or autogonal projection) local angles are preserved; that is angles about every point on the projected map are the same as the angles around the point on the curved reference surface. Similarly constant local scale is maintained in every direction around a point. Therefore shapes are represented accurately and without distortion for small areas. However shapes of large areas do get distorted. Meridians and parallels intersect at right angles. As a result of preserving angles and shapes, area or size of features are distorted in these maps. No map can be both conformal and equal area. Tissot’s indicatrices are all circular (shape preserved) in this world map Mercator projection, however they vary in size (area distorted). Here the area distortion is more pronounced as we move towards the poles. A classic example of area exaggeration is the comparison of land masses on the map, where for example Greenland appears bigger than South America and comparable in size to Africa, while in reality it is about one-eight the size of S. America and one-fourteenth the size of Africa. A feature that has made Mercator projection especially suited for nautical maps and navigation is the representation of rhumb line or loxodrome (line that crosses meridians at the same angle) as a straight line on the map. A straight line drawn on the Mercator map represents an accurate compass bearing. Preservation of angles makes conformal map projections suitable for navigation charts, weather maps, topographic mapping, and large scale surveying. Examples of common conformal projections include Lambert Conformal Conic, Mercator, Transverse Mercator, and Stereographic projection. In equidistant map projections, accurate distances (constant scale) are maintained only between one or two points to every other point on the map. Also in most projections there are one or more standard lines along which scale remains constant (true scale). Distances measured along these lines are proportional to the same distance measurement on the curved reference surface. Similarly if a projection is centered on a point, distances to every other point from the center point remain accurate. Equidistant projections are neither conformal nor equal-area, but rather a compromise between them. 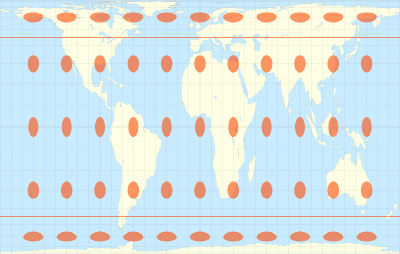 In this world map equidistant cylindrical projection (also known as plate carrée), Tissot’s ellipses are distorted in size and shape. However while there are changes in the ellipses, their north-south axis has remained equal in length. This indicates that any line joining north and south poles (meridian) is true to scale and therefore distances are accurate along these lines. Plate carrée is a case of equirectangular projection with Equator being a standard parallel. Equidistant projections are used in air and sea navigation charts, as well as radio and seismic mapping. They are also used in atlases and thematic mapping. Examples of equidistant projections are azimuthal equidistant, equidistant conic, and equirectangular projections. Directions from a central point to all other points are maintained accurately in azimuthal projections (also known as zenithal or true-direction projections). These projections can also be equal area, conformal or equidistant. The gnomonic map projection in the image is centered on the North Pole with meridians radiating out as straight lines. In gnomonic maps great circles are displayed as straight lines. Directions are true from the center point (North Pole). True-direction projections are used in applications where maintaining directional relationships are important, such as aeronautical and sea navigation charts. Examples include Lambert Azimuthal Equal-Area, Gnomonic, and azimuthal equidistant projections. Some projections do not preserve any of the properties of the reference surface of the Earth; however they try to balance out distortions in area, shape, distant, and direction (thus the name compromise), so that no property is grossly distorted throughout the map and the overall view is improved. They are used in thematic mapping. Examples include Robinson projection and Winkel Tripel projection.